Offers high storage density, ease of management, and scalable storage and backup performance. Memory chip delivers faster access time and enhanced media monitoring. Superior "smart grabber" mechanism and mechanical interlock prevent the leader pin from being pulled inside the tape housing. Sensors detect proper connection and prevent leader loss that would ruin the tape. Significant increase in performance - possible to store 2.7 TB/hr using LTO-8. Built-in AES 256-bit encryption (IEEE1619.1) (LTO-4, LTO-5, LTO-6, LTO-7, LTO-8) - granted FIPS140-2 Level 1 certification. Tape is more reliable than Enterprise SATA disk. With a BER of 1x10 to the power of 19 for LTO-8 versus 1x10 to the power of 15 for Enterprise SATA HDD’s. That’s a difference in reliability of four orders of magnitude – e.g. tape is 10,000 times more reliable than Enterprise SATA HDD. Estimated data loss over 10 years for 1 Exabyte archive is 1.1 Petabytes for HDD compared to only 7.4 Terabytes for tape. 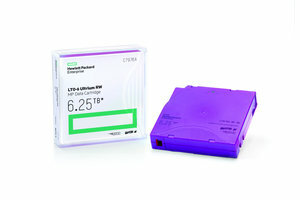 Data encryption for enhanced data security on HPE LTO-4, LTO-5, LTO-6, LTO-7 and LTO-8 Ultrium. Compliance with FIPS 140-2 level 1 security standards.